This tutorial covers the basic steps to create and paint an image in PhotoShop that can be stamped onto a 3d model using PowerStamper. 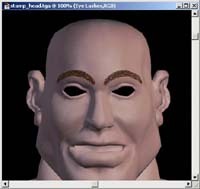 In this tutorial we will use Adobe PhotoShop to paint an image that will be used to stamp the eyelashes into the material bitmap of a head model. 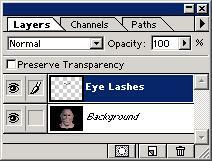 Go to Select > Load Selection and in the dialog box set the Source Channel to the layer's transparency (Eye Lashes Transparency). Go to Select > Save Selection. 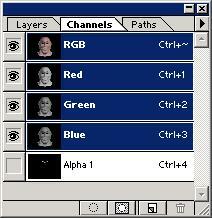 If you saved stamp_head.tga as a 32 bits bitmap, replace the current alpha channel setting Channel to Alpha 1. If not, just save the selection as a new channel. To do so, fill the Background with a black color. 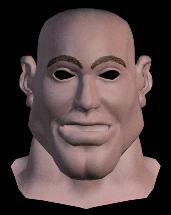 Finally, save the head_stamp.tga image as a 32 bits bitmap. You can use Save a Copy... or Flatten all the layer and save the image. Action 1: Create a new Layers. Action 2: Load the selection from the layer 1 transparency. Save the Selection to the Alpha Channel. Fill with black the background color. Flatten the image.